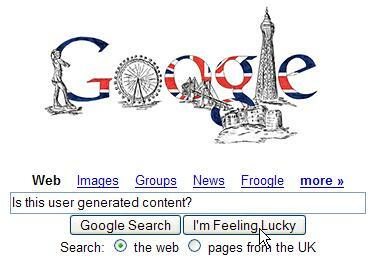 Ministry of Propaganda - 06/Nov/2006: "Google UK Doodle"
Three entries on one day, haven't written that many for a long long time. But this one is in a way time sensitive and really needs to be posted today to make much sense. As of writing this the Google UK homepage has been showing the winning logo of the Doodle 4 Google competition for three hours and will continue to do so for another 21 hours. There is also some local interest (well, at least for those living in Wiltshire like me), as the winning logo was drawn by 13-year-old Katherine Chisnall from Wiltshire. A lot of geeks will be very jealous of her, as she gets to visit the Googleplex... And there are a few more winners.